Can NBC/Comcast close the gap on ESPN who currently towers above every competitor that spans CBS, NBC, Fox, Sports Illustrated, Turner, and Yahoo? It's hard to believe it was over three years ago when it was announced Comcast would acquire a majority stake in NBC Universal, a deal which set the framework for the full out acquisition of NBC Universal that recently was completed. When the deal was initially announced back in December in 2009, many including myself, thought there was some potential for the combined assets of Comcast and NBC to mount a challenge to ESPN. Maybe it was wishful thinking as I know many sports fans I talk to are getting tired of being dependent on ESPN for so much of their programming. "During the 1995-96 television season, for the only time in history, the World Series, Super Bowl, NBA Finals, and Summer Olympics were telecast by the same network." From London 2012 through Super Bowl XLVII, those four events would be spread across four different networks. But slowly, fiscal prudence on sports rights saw NBC lose their foothold in sports. The NFL, MLB, and NBA would all leave and for many, the coverage of these sports has not been at the same level ever since, although NBC's reacquisition of NFL rights through Sunday Night Football has softened that blow. Fast forward to the announcement that Comcast and NBC were now a combined entity with ESPN in their sights and the NHL, Notre Dame, and the Olympics along with a nice portfolio of web properties and sports regionals in their back pocket. Many envisioned a slow but steady pursuit of ESPN. I told fans who complained to me about ESPN that NBC would begin to challenge their dominance, but that it would "take a decade" to get there. However, after another swing and a miss on sports rights fees (this time the Big East which will stay with ESPN with some help from Fox) and slim pickings going forward in addition to meager ratings on original programming, you have to wonder if NBC can ever get into ESPN's punching class. Even more shocking is the fact that Fox, a network not particularly known for its high quality sports broadcast experiences, may have jumped NBC on the totem pole with Fox Sports 1, a network that has not even launched yet or even been officially announced. The acquisition was announced in late 2009. Approval did not come until early 2011. It's hard to make confident and aggressive decisions on sports media rights and strategy when you don't know who will be in charge and when. The NHL is NBCSN's crown jewel in non Olympic years. When the acquisition was announced back when NBCSN was branded as Versus, the channel was in a carriage dispute with DirecTV in the middle of hockey season. The dispute dragged out for months, which effectively kept the network's NHL coverage away from 20 million households. Nearly a full regular season was missed by subscribers, surely enough to hurt ratings and awareness of the channel which had some lasting effects. Maybe it's me and my work in startups, which forces your ability to be nimble, but my god was the rebranding from Versus to NBC Sports Network the most painfully slow yet obvious move I've seen in a long time. In January 2011, the deal was finalized. In April of 2011, it was announced Versus would be rebranded to something that likely included "NBC" and "Sports" and that decision would come sooner than later. Hmmmm……. NBC Sports ________? Yes, let's take another 90 days to figure this out. We're going to need all the conference rooms, some consultants, multiple focus groups, dinner brought in for months, and time on the weekends to make sure we get this one right. Sadly, a full 7 months passed from when the acquisition cleared regulators to when the new name and branding was rolled out. The fruit of all of this work and planning, three words (NBC Sports Network) and a peacock logo with the words "Sports" and "Network" stacked underneath it in two different fonts. That 2 font idea….. definitely worth the 7 months. But it gets worse. NBC only announced the rebranding in August of 2011. It actually didn't go into effect until 2012 making it a full year under the Versus brand after the acquisition. This also meant switching the branding in the middle of the NHL season. During this year NBC had to maintain a Versus website, promote that brand, and continue selling ads to buyers under that name. You have to figure it would have been easy to make the switchover much sooner to start getting awareness and traction ahead of time. Do you know what channel NBCSN is off the top of your head? How far is it from ESPN? We tweeted this question a while back and found that in some cases the two channels were close together numerically on the program guide. All too often though they were separated by hundreds of channels in an area where not that many viewers look for programming. Recently, DTV moved NBCSN from 603 to 220 where it's not too far away from ESPN at 206. I found during the Olympics that a lot of people struggled to find the channel and many questioned if they even got NBCSN. On the television sets of sports fans around the country, that may still be the case. In football, some say "get ahead and stay ahead." It's because of this that many football teams opt to receive the opening kickoff and take the ball first. For NBC, they had no choice. They were on defense first as their first year under Comcast ownership saw them have to fight to keep their existing properties before having a chance to actually move the needle by getting new rights. If the timing was different, you could have potentially saw NBC make big bets elsewhere before revisiting their existing portfolio. Instead it was imperative for them to keep what they had leading off. Within 4 months of being under Comcast, NBC reached a 10 year deal with the NHL worth about $2 billion. Next up were the much more expensive Olympics, a staple of NBC. Heading into the bidding process, many tabbed either Fox or ESPN as the favorite to win rights for the next 2 or even 4 Olympics. Comcast/NBC was the third most likely according to betting companies. But Fox and ESPN's interest was a smokescreen, which may have forced Comcast/NBC to elevate their bid. When the smoke cleared, Fox was runner up with a bid of $3.4 billion for 4 Olympics and Comcast/NBC was the victor at $4.4 billion for 4 Olympics. NBC put a full billion dollars on the table more than they needed to, money that is no longer in play for sports media rights bidding. Fox and ESPN execs seemed happy about the result and how the process played out as they drank together awaiting the result and later joked that NBC overpaid for their winning bid. You would have to think if NBC only bid Fox's second place amount, the IOC would have stayed with NBC. Instead, NBC spent an extra billion dollars or 30% premium over the FOX bid for about 60 days of programming that will be spread over a decade. This wouldn't be the last time the Fox-ESPN relationship thwarted NBC. It was almost a done deal. NBC/Comcast had made a strong presentation to the Pac 12 and their media savvy commissioner, Larry Scott. More importantly $225 million a year was on the table and ESPN and Fox didn't have enough programming hours available to make competitive offers. "They agreed to meet on April 28, when Skipper and John Wildhack, ESPN executive vice president, flew across the country to meet at the Fox lot in Los Angeles. The ESPN duo met with Freer, Fox Sports COO Larry Jones and Karen Brodkin, senior vice president at Fox Cable Networks. "Neither side looked at this as a way to try and do a land grab," Wildhack said. "Fairly quickly, both of us found that we had a lot more in common than not." Over a seven-hour meeting that day, they came up with a bid that would split the rights — 22 football games each — and pay the Pac-10 a whopping $3 billion over 12 years, or $250 million a year. The deal would blow past Comcast's best effort, which eventually rose to $235 million. Last week, Comcast's Brian Roberts told CNBC that his company did not land rights to the Pac-10's TV package because it was "financially disciplined." After the long meeting, the executives from both networks hurried to the Los Angeles airport and grabbed a red-eye flight to New York. They knew the next day would be a long one, as they jointly engaged in negotiations with the Pac-10." All in all, a major setback early on for NBCSN. The NFL on NBCSN? With the NFL looking to add more Thursday games (which they did this past season), the strong favorite to win the rights was considered to be NBCSN. But the Thursday Night package ended up being a painful tease. The NFL instead opted to keep all of the Thursday games on their NFL Network, hoping to increase their carriage fee and distribution footprint which has been effective as Time Warner has since picked up the channel. The thinking is that at some point they will split the Thursday games into another package, but probably not for a while. When that happens, it will be interesting to see if Fox or even ESPN will be in better position to outbid NBCSN than they were two years back. It seemed perfect, although the economics were questionable. Since MLB has left NBC, ratings have sagged to the point where World Series numbers are about half of what they were when NBC had them. More importantly, many believe the quality of those broadcasts have gone downhill. NBCSN needed to get the ball rolling, had personalities in place and a history with baseball. It's my belief MLB threw itself at NBC hoping for a bid as they asked for the former Fox and Turner packages to be combined into one. At the time, Fox didn't really have a cable strategy to make that work and Turner didn't have a main network with the same visibility as Fox. The only real media company with the platforms and needs to combine those packages was NBC. But it wasn't to be. ESPN preemptively retained their package which ended up being the package that NBC was most interested in. NBC balked at the combined package concept and didn't make a real bid on either package once Fox and Turner persuaded MLB to sell them as is individually. This feels like the biggest missed opportunity as three different competitors won out over the company most in need for programming. It also was the only real opportunity outside of Olympic years for NBCSN to have substantial viewers during the summer where MLB runs unopposed. The NHL+MLB would have given NBC nearly year round relevancy. This current season was supposed to be the NHL's first full season under the NBCSN banner. It was not to be though as an ugly lockout wiped out nearly half of the regular season and pummeled NBCSN ratings for the late fall and early winter. NBCSN had to scramble to fill those programming hours and has had to go on the PR defensive as their ratings without the NHL are constantly mocked by observers (not just us, just Google NBC Sports Network ratings). ESPN has quite an accomplished history in meddling with realignment and conference expansion. This is most noticeable in regards to the Big East, who ESPN offered $135 million per year not so long ago, an offer which was rejected. The end result a year later was the Big East getting pummeled to the point where they had to accept a deal for $20 million a year, a fraction of the former offer, with the same company. How did such a fall occur? The end result being conferences with long term deals with ESPN absorbing the more lucrative schools from the Big East, whose deal was winding down and future was uncertain. Adding insult to injury, after a mass exodus of the conferences top tier schools, the basketball only core members left to become "The Catholic 7" and are reportedly going to land with Fox. To recap, ESPN helped usher the big money schools towards conferences they had long term deals with. The instability debilitated the Big East to a point that the basketball schools left for Fox. Meanwhile the Big East took it in the chin so badly their rights plummeted to less than 1/7th what was on the table a year ago and to a point where ESPN could afford to match NBC's offer to keep them out of the college game again. While still not worked out, ESPN will supposedly offload some of the Big East's package to Fox Sports 1. Yet another successful game of keep away with NBCSN unable to outmaneuver the combined forces of Fox and ESPN. When CBS was in danger of losing the NCAA tournament to ESPN a creative partnership was forged with Turner to retain the package. The two also considered a joint bid on the Olympics as well. Now ESPN and Fox have worked together on several fronts with the idea of keeping NBCSN where it is now. 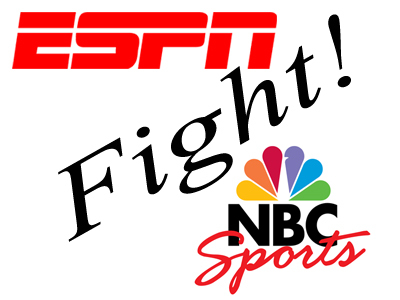 Unfortunately there doesn't seem to be a good dance partner or any ally for NBC/Comcast and it seems that a lot of that stems from the fact that a long term NBC vs. ESPN rivalry has awoken and become more intense since Disney's merger with ESPN and Comcast's merger with NBC. Meanwhile there is Fox, ESPN's wingman, who seems to be content to be a competitive ally. Part of me thinks that ESPN would rather help Fox than NBCSN merely because they know NBC has a strong history of quality production of multiple sports while Fox drawn a lot of ire that includes glowing pucks, abysmal BCS coverage, and of course Joe Buck and Tim McCarver. Basically if this was a reality show, ESPN would rather work with Fox to vote off NBC so that the competition in the final two is easier for them. It should be noted that NBCSN has had some victories along the way. The EPL and F1 and Tour de France and hey NASCAR is a possibility. Unfortunately most rights deals of significance have been locked up. The NBA is up for grabs on the horizon, but it's hard to see ESPN without both pro winter sports (NHL and NBA) and for NBCSN to have both, although Turner will have to renew their rights as well. The B1G 10 or 12/14/16? follows not too long after and that could be interesting as some type of split package may become available. The rumored Thursday Night NFL package could come to fruition as well. But for now NBCSN is stuck with limited properties and the momentum, buzz, and optimism has evaporated since the Olympics. If we truly are in a sports media rights bubble and that bubble actually pops in the next decade, then the financial prudence of NBC/Comcast will be a blessing in disguise. However, when you add it up it feels like an opportunity lost. NBCSN came close multiple times but was consistently nipped at the end or experienced bad luck. In media, you need scale and relevancy and usually you need to pay for it. This isn't Comedy Central where a troika of South Park, The Daily Show, And The Chappelle Show can thrust you to where you need to be. Live games is what moves the needle and at a certain point you have to be brash and buy a seat at the table to play the game, which means overpaying. That's what FOX did when they entered the market when acquiring the NFL rights in the 90's. In regards to a real ESPN competitor, it looks like I was wrong. It's probably not happening this decade. Maybe next decade and even then it might be Fox and not NBC. Hopefully for NBC, Bob Costas continues his mysterious lack of aging and the Olympics continue being tape delayed. Until then, Bristol is going to remain at the top of the food chain by a good margin.